increase productivity by clarifying roles, minimizing interruptions, and delegating tasks. Please join me at the Lilybugs Children’s Consignment Sale to find some great deals on gently used clothes, toys, and baby equipment. All proceeds from the sale benefit local charities and non-profit organizations! Lilybugs is a quality children’s consignment sale held twice yearly—spring/summer and fall/winter—offering the best in high quality gently used children’s clothing and shoes, maternity clothing, baby equipment, children’s furniture, outdoor toys, books, software, videos, and lots and lots of toys! FYI : I will have a Clever Container display in the “Mommie Mall” during the sale. Stop by, say hello, and enter my drawing for your chance to win a Couponizer! Do you know anyone else who loves organizing products (or could really use some help)? Please pass this information along to your contacts… The more the merrier! Have you heard the news…!?! I have recently partnered with Clever Container to offer some of my favorite organizing products alongside my in-home [ real neat ] workshops! Much like my workshops, Clever Container Classes feature practical time- and space-saving organizing solutions to help you conquer procrastination, declutter your space, and reclaim your life! Plus, you can host a class in your home or office to earn free organizing products! I am honored to be the founding consultant for the state of Kentucky and I could really use your help… Please join me—online at www.CleverMichelle.com or in-person at the upcoming Lilybugs Children’s Consignment Sale—to learn more about this exciting new venture! P.S. Be sure to stop by later this week for your chance to win some fabulous giveaways! 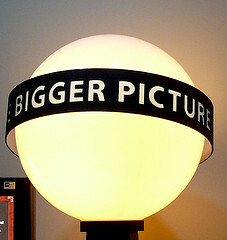 What Does Your Big Picture Look Like? And, this month has been no exception. I’ve been back at it again… full force… trying to determine exactly what my big picture looks like. Particularly for my business. I’ve found myself so consumed by the precise details of the ‘how’ that I’ve really lost focus of the ‘why’ (as in why I’m ‘doing this’ in the first place)! Indeed, I am a professional organizer. But, I am not here to help you ‘get organized’! So, let me ask that question again… What does your big picture look like? Michelle has great ideas to help you get organized and she keeps it simple. I will definitely use her services again in the future.